Online fundraising tips, tricks, and best practices. And the odd rant. Classic Google… just like that, what seems like a small announcement has the potential to shake up the way all of us do email fundraising and campaigning. On the face of it, Google is making things a lot easier. 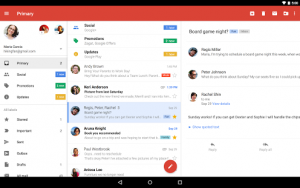 People will be able to interact with you from within the gmail app on mobile without having to go to a new webpage. Especially if you’re asking for donations, this has potential to be a game changer. The AMP for Email feature will allow you to do things like RSVP to events, browse and interact with content, or fill out forms without leaving an email. For example, Google says if a contractor wants to schedule a meeting with you but isn’t able to see your calendar, they’ll contact you about availability. With AMP for Email, you could respond interactively through a form without ever leaving the email client. The vast majority of your donations online will be driven through email (it’s how Obama, Bernie, and Labour in the UK made most of their cash!) so potentially having a donate form with pre-filled name and credit card details within the email itself is really really big. So this means huge opportunities: more engaging email and higher action rates, purely because people won’t have to leave their inbox to take action with you. But it’s not all fun and games – it could provide some major challenges. It’s planning to make the changes through its AMP (accelerated mobile pages) tech. AMP has been called a “blight on the web” and coming to email is largely being called a bad idea and a power play by people that know things about the internet. Just getting technical here: to use AMP means adding a third MIME-type to emails, which most email service providers don’t offer. For non-techies: you’d need to create a unique email just for Gmail. It’s still early days – I’m looking forward to seeing how this actually rolls out.